What do you do for Lent? For some it’s a period of withdrawal, of turning away from the world for a brief period to focus on personal faith. For some it’s a time of deepening, and for others it’s a chance to give up something that gets in the way of faith. Often Lent is a time of inwards-looking faith, but Christianity has never been a simply instrospective movement. Rather, it's an outwards expression of hope and faith. So why can’t Lent also be a period of outwards expression? How can I receive God’s life more fully? How can I live God’s life more generously, imaginatively and joyfully, in such a way that others can see it, hear it and take hold of it themselves? Every day has a new theme, and a new way to witness to those around you. Whether that is noticing when to offer a word of strength or gentleness to someone, or even just doing one small act of kindness. #LiveLent is a six week journey of living out your faith, of learning to reach people in the world when they most need it, of letting your light shine for all to see - and there’s more than one way to join in with #LiveLent. As well as the #LiveLent booklet, there’s a daily reflection you can receive to your phone or email, a #LiveLent app, a 5 session course, images and resources to share, and the LiveLent social media hashtag to share and find stories of lives being changed when people chose to share the light. 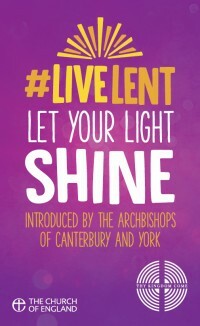 With an introduction from both Justin Welby and John Sentamu, #LiveLent is part of ‘the Church of England’s Renewal and Reform programme, aimed at helping us become a growing Church for all people and for all places.’ Whether this is the first step on a journey of sharing your faith, or an encouragement to keep on sharing good news with the world, this new series will encourage to not just to do Lent, but to #LiveLent. Written by John Kiddle, the #LiveLent booklets can be bought in packs of 1, 10, and 50.